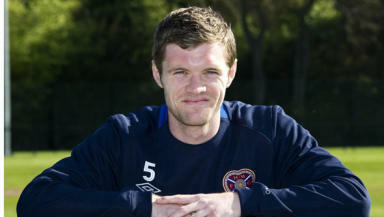 Hearts defender Barr ‘just wants to play’ after series of injury scares. Heart’s defender Darren Barr has vowed to shake off his ‘forgotten man’ tag – and seal a third place finish for the Edinburgh club in the process. The 26-year old was signed from Falkirk last summer and has so far failed to hold down a regular place in the Tynecastle first team squad. Injuries and patchy form have left Barr behind the likes of Marius Zaliukas and Andy Webster in manager Jim Jefferies’ plans and he has made just one appearance since December. However, after revealing he was finally on the road to fitness the former Scotland U-21 star renewed his determination to kick-start his Hearts career by helping to seal third place in the SPL. Ahead of tomorrow's trip to Kilmarnock, Barr said: "I had to get a hernia operation and it's been recurring over the last few weeks so I've been getting injections to see if it settles down. "I need to try and get myself back in the swing of things and hopefully kick on from there. Personally it's been a bit frustrating more than anything. "I felt I did okay. I went out of the side and the boys went on a good run. I got back in and got a wee injury." Barr’s return from injury could not have come at a better time for third-placed Hearts, who are struggling to seal their status as best of the rest in the SPL. The Jambos have failed to win their last four league outings and face difficult trips to Ibrox and Tannadice during the championship run-in. Nearest challengers Dundee United sit seven points behind and will be looking to take advantage of any further slip ups from Jefferies side. However, Barr is confident that his side can produce the results when it matters and record a much needed victory against Kilmarnock on Saturday. He added: "We've not been playing badly. It's about trying to get the wins to get over the line. "It doesn't matter what the other teams do, it's about what we do. If we get the win on Saturday that could be it."